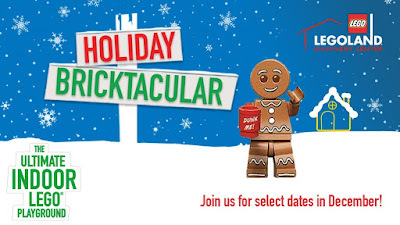 Families are invited to celebrate the merriest of seasons with LEGOLAND® Discovery Center Atlanta’s Holiday Bricktacular all December long! LEGOLAND Discovery Center Atlanta will kick off the holiday festivities on Saturday, December 2 and Sunday, December 3 with its annual, group Big Tree Build measuring 7 feet tall! Guests can also learn how to create LEGO® presents and experience the winter takeover in MINILAND® every weekend of December! During the month of December, groups with at least one jolly person wearing an ugly holiday sweater will receive 10 percent off of their retail purchase, some restrictions apply. Families are invited to take part in the annual LEGOLAND® Discovery Center Atlanta Thanksgiving Food Drive, benefiting Atlanta Community Food Bank through the month of November. Leading up to Thanksgiving, guests are encouraged to drop off non-perishable food items at the LEGOLAND Discovery Center Atlanta admissions counter. Guests who graciously donate three or more food items will receive a Kids Go FREE voucher!